In September last year, Motley Crue frontman Vince Neil confirmed that the band were back together and working on new material. 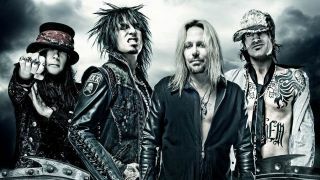 Bassist Nikki Sixx later reported that the four songs they were recording with Bob Rock were for the upcoming Crue biopic The Dirt – which will premiere on Netflix on March 22. The film will star Daniel Webber as Neil, Douglas Booth as Sixx, Iwan Rheon as guitarist Mick Mars and Machine Gun Kelly as drummer Tommy Lee – but it appears that rapper Kelly will play a bigger role than first thought. The Dirt will also feature Tony Cavalero as Ozzy Osbourne and David Constable as Doc McGhee.